Julia had her 4 month checkup. She weighed 11 lbs – 12.5 oz. and measured 24 1/4 inches long. This is an increase of 1 lb – 6 oz. and 2-1/2 inches over the last 2 months. Julia is now at the 50 percentile for height. No wonder that she no longer fits in a lot of one piece outfits she has. The doctor was pleased with her growth. We discussed the number of feedings and my approach to her feeding. I’m trying to be a little less of an engineer when it comes to feedings. I am letting her ask for food before I offer (most of the time). I just like things I can measure. Julia is pretty laid back about everything including asking for meals. We will see if she changes with my new approach. 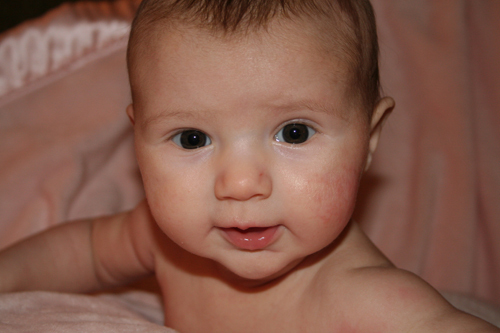 We also discussed my ongoing struggle with Julia’s dry skin and cradle cap. He has made some suggestions and I am hoping that we can make her more comfortable. Julia received two shots and one oral vaccine to keep her current on her shots. We had a fussier than usual evening which we are blaming on the sore legs, but maybe she just wanted to milk it for extra attention. The doctor and I had a follow-up discussion about her heart condition. I had hoped that he would have received a report from the heart doctor before our visit, but it hadn’t arrived yet. So our discussion was all based on my comments. It is hard to remember everything and the names of conditions. Our doctor admitted his concern at her last checkup was that Julia had a heart defect because what he heard just didn’t sound like the typical murmur. He was glad to hear that Julia’s condition may be the less serious PFO condition. I will see if he has any other thoughts or comments at our next visit, which is at 6 months.